My online notebook of works in progress, my own opinions and sometimes an odd snippet of useful information. I have had this idea for a last-minute volunteer bus for which you pay a small fare (say £25) and you could go off and do something useful at weekends without too much planning ahead. I suppose you could describe it as a volunteer gangmasters, in which case it'll probably wither on the vine from bureaucracy. It would pick you up in the city (say London) on a Friday night and take you to wherever volunteers were needed (say the East Anglian coast) and put you up in a campsite or places like Darsham Station. Friday night would be for orientation and briefing. On Saturday morning you'd be given your shovel and gloves and a chance to get stuck in and after a great day of fence making or litter picking, in the evening you could sit around the camp fire or go down the pub with that fit bird/bloke you have met. After a less strenuous Sunday, the bus would take you back in the evening. People who want to volunteer for a week would set up and run each camp under the guidance of one or two staff. When I was younger, ten years ago before I had kids, I looked into helping out like this but the opportunities always seems too far off in time and distance or at an inconvenient time or they were too short or too long a commitment or entry was competitive but mainly it was just too much of a faff to get there. Naturally conservation work tends to be done in places with poor transport options. Now that my kids can manage if one of their 'rents is away for the weekend, when googling around now I don't see much has changed. I can't understand why there's so many roadblocks to giving your help. I don't want to do a gap-year, I just want to give a weekend. As a freelancer, which more people are these days, it's sods law that if I book to do something, I'll have to cancel at the last minute or turn down paid work. I think there's plenty of energy in young people who would be attracted to the idea of doing something useful for one weekend instead of getting trashed at a festival. Camping in our scheme would be no less comfortable! People I've asked of that inclination say their impulse to do something is quickly dissipated by having to do it on a weekday or pay money for fares or equipment or take some training or be qualified at something or sign up months in advance. To set up such a scheme I reckon an hired coach and a Luton van is all you need besides a stock of donated camping gear and basic tools. I think it's feasible to start with a London-Suffolk/Norfolk pilot scheme, given the density of potential projects and people there. Even if a conservation organisation didn't have a particular project in mind, just picking litter up off the beaches or doing a wildlife survey, just like how Radio 4 asked listeners to count spiders this morning, would be useful. Everyone I pitch this to says it's a good idea. Perhaps that's because I give them wine. I suppose the next step is to talk to some experts in conservation work to find out: 1. Why this isn't done already? 2. Could it work? 3. Would they take part? I gather there's some money around for ideas like this. I know a bit about finding sponsors and donors to get things started if I have a solid plan and the right people aboard. I myself have had very little experience in conservation work but I have taught outdoor activities to young people and I do know a lot about mobilising people and equipment for movies and pop festivals. Anyone with an army or circus background would also know how to make it work. Are you an expert in this area? Do you know any experts I can talk to? If you do, please get in touch. 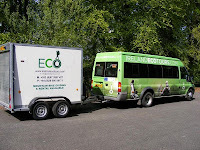 Ireland's Eco Tours pictured above don't do direct conservation work but do raise awareness of the environment while offering holidays although their biofuel mini bus looks to be a model operation. My name is Nat Bocking. These days I am interested in making communities and organisations work better and work sustainably. All works herein should be considered someone's copyright if its not mine.